The list of courses offered by Al-Qalam University are displayed on this page. Candidates who wish to apply through JAMB should click on any of the courses to see the course requirements. Established in 2005, Al-Qalam University, Katsina is a private higher education institution located in the small city of Katsina (population range of 250,000-499,999 inhabitants). Officially accredited and/or recognized by the National Universities Commission, Nigeria, Al-Qalam University, Katsina (AUK) is a coeducational higher education institution formally affiliated with the Islamic religion. 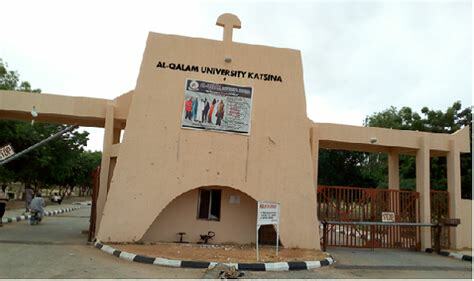 Al-Qalam University, Katsina (AUK) offers courses and programs leading to officially recognized higher education degrees such as bachelor degrees in several areas of study. See the uniRank degree levels and areas of study matrix below for further details. Do the university offer msc in biological scinces? please is there a female hostel for girls.. another question is i have natinal diploma with grade of 2.47 can u accept that please. thank you am waiting for the feedback. I Hv HND Accounting, Wll U Offer Me Special Admission, That’s 300level In Accounting? Pls I scored 181 in my jamb will I be given admission to study computer science, pls will I be given. Does Al Qalam accept direct entry level to 200L? what is the minimum cut off mark for this year – 2017?